Morta color based on age. Bog-wood, also known as abonos and morta, especially amongst pipesmokers, is a material from trees that have been buried in peat bogs and preserved from decay by the acidic and anaerobic bog conditions, sometimes for hundreds or even thousands of years. The wood is usually stained brown by tannins dissolved in the acidic water. 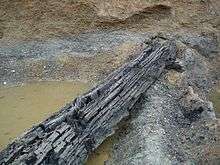 Bog-wood represents the early stages in the fossilisation of wood, with further stages ultimately forming lignite and coal over a period of many millions of years. Bog-wood may come from any tree species naturally growing near or in bogs, including oak (Quercus – "bog oak"), pine (Pinus), yew (Taxus), swamp cypress (Taxodium) and kauri (Agathis). Bog-wood is often removed from fields etc. and placed in clearance cairns. It is a rare form of timber that is "comparable to some of the world's most expensive tropical hardwoods". Bog-wood is created from the trunks of trees that have lain in bogs, and bog-like conditions such as lakes, rivers and swamps, for centuries and even millennia. Deprived of oxygen, the wood undergoes the process of fossilization and morta formation. Water flow and depth play a special role in the creation of morta. Currents bind the minerals and iron in the water with tannins in the wood, naturally staining the wood in the process. This centuries-long process, often termed "maturation," turns the wood from golden-brown to completely black, while increasing its hardness to such a level that it can only be carved with the use of specialty cutting tools. While the time necessary for the oak to transform into abonos varies, the "maturation" commonly lasts thousands of years. Due to the ecological reasons mentioned above, no two trunks can be found of the same color. Sites of quality bog-wood in the world are very rare. In the sites expected to accommodate it, morta is hard to find and access to the river bank and its bed is often difficult. Therefore, excessive preparations and the engagement of professional divers are necessary for morta recovery. Morta is located in conditions of total darkness and its extraction marks its first exposure to light after many thousands of years. 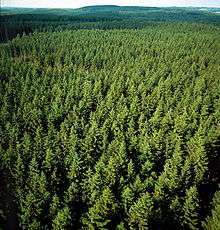 In England and Ireland, the three main types of bog-wood that can be found are Yew, Oak and Pine. Reserves of the ancient wood can also be found in Russia and Ukraine, where the Northern region has a climate favorable to growth of oak. In Croatia, bog-wood is found mainly in the valley of the Sava River and its tributaries. The age of morta found in Croatian rivers ranges from several hundred years in the rivers on the southern part to the oldest retrieved so far from the Krapina River being 8290 years old. Saving the wood for further processing is a very delicate matter. Extracted logs must be wrapped in plastic and meticulously dried to prevent warping. The process of wood desiccation is complex, but despite great care most of the raw wood is unsuitable for further processing. For this reason the price of high quality raw abonos is very high. Bog-wood is characterized by natural staining and variations in color and the direction of growth rings. Well preserved bog-wood is not affected by weather conditions or vermin that would spoil its look and strength. Semi-dry bog-wood is sometimes of a golden or copper color, or with a tint of some other hue, and is exceptionally hard. Older wood can be completely black, yet possess the rich variations in hue characteristic of “live” wood. This dark hue is a special feature of abonos as construction material whether it be used for the making of semi-manufactured goods, veneer or planks. . Bog wood in an aquarium releases tannins into the water, turning the water brown. 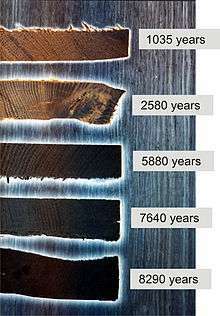 Because bog-wood can remain free of decay for thousands of years it is of use in dendrochronology, often providing records much older than living trees. Wooden artefacts lost or buried in bogs become preserved as bog-wood, and are important in archaeology. Bog-wood may be used in joinery to make furniture or wood carving. Bog-wood sometimes has aesthetically interesting shapes (similar to driftwood) and may be use as ornaments. As bog-wood dries out, it may crack or split, but this does not necessarily detract from its aesthetic qualities. Due to its natural color, it is a traditionally favored wood for the carving of dirks (bìodagan) and sgian-dubh in the Scottish Highlands. 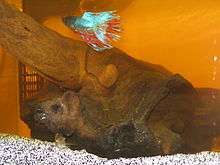 Bog-wood is used in aquaria for ornaments, providing hiding places for fish and a growing surface for plants such as Java fern. Additionally, the leaching of organic compounds such as tannins into the water causes a brown coloration. During the nineteenth century bog oak was used to make carved decorative items such as jewelry  and in some parts of the world it is still used to craft unique artifacts. Prized in the Tudor period for its dark hue, bog oak was used to construct the throne of Peter the Great as well in the construction of Venetian places and the bedroom suite of Louis XIV. One of the uses of morta is for making of tobacco pipes. It is an ideal material because of a high percentage of minerals, reaching up to 12%, which makes morta especially resistant to burning. Because underground currents erase all traces of tannin, resin and similar ingredients in bog-wood, pipes constructed of the ancient wood provide a neutral taste during tobacco smoking. Due to the challenges of extraction and processing, today there is a relatively small number of pipemakers who make pipes out of morta. In addition to pipes, bog-wood has traditionally been used to construct decorative objects and items for everyday use. Today, modern drying techniques have made it possible to preserve larger planks of bog oak that are suitable for floor coverings, furniture, doors, window frames, and sculptures. Mopane wood, recovered from deserts and often sold as an alternative to bogwood for aquaria; it is sometimes incorrectly labelled as bogwood or charred bogwood. Sweet Track, a timber causeway in Somerset, England, its timbers preserved in waterlogged ground for over 5,800 years. 1 2 3 4 5 6 7 8 Đenović, Davorin. "What is abonos-morta?". Retrieved 2 December 2013. ↑ "Huge 5,000-year-old oak unearthed". BBC. 2012-09-26. Retrieved 2012-09-27. ↑ McGhee, Maureen. "History of Irish Bog Oak". Maureen McGhee. Retrieved 2016-08-31. ↑ "OUR PRODUCTS". teltinc.com. Retrieved 2016-08-31. ↑ "What is Bog Oak?". Telt Inc. Retrieved 3 September 2016. ↑ "How to grow plants on bogwood". AquaDaily. 2009-01-20. Retrieved 2009-01-31. ↑ Tanenbaum, Carole; Rita Silvan (2006). Fabulous Fakes: A Passion for Vintage Costume Jewelry. Toronto: Madison Press. p. 22. ↑ "Souvenirs made out of abonos". Retrieved 2 December 2013. 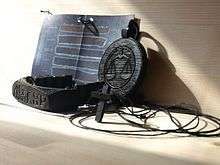 ↑ "Bog Oak History". Royal Oak. Retrieved 3 September 2016. ↑ "Curran & Sons Throne Chair". Royal Collection Trust. Retrieved 3 September 2016. Wikimedia Commons has media related to Bog-wood. Look up bogwood in Wiktionary, the free dictionary. Information and pictures on Bog Oak in natural form as well as finished artworks. Irish Peatland Conservation Council - Information sheet on bogwood and its formation in Irish peat bogs.